A laboratory technician in Bangladesh manipulates multi drug resistance tuberculosis (MDRT) samples. 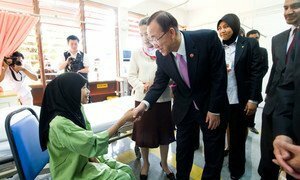 Secretary-General Ban Ki-moon marked this year's World Tuberculosis Day with a call for a greater push to eliminate once and for all the second top infectious killer of adults after HIV/AIDS. Observed annually on 24 March, World TB Day raises awareness about the global epidemic and efforts to eliminate a disease that the Secretary-General said has not received sufficient attention and resulted in needless suffering. In 2010 alone, nearly nine million people fell ill with TB and 1.4 million died, with 95 per cent of these deaths occurring in developing countries. These numbers make tuberculosis – an infectious bacterial disease that most commonly affects the lungs – the second top infectious killer of adults worldwide. The impact reverberates far beyond the individuals directly affected, the Secretary-General pointed out, adding that the disease takes a heavy toll on families and communities. Earlier this week, the UN World Health Organization (WHO) and the Stop TB Partnership warned that childhood TB continues to be overlooked despite availability of treatment. The disease often goes undiagnosed in children under the age of 15 because they lack access to health services or health workers do not recognize the signs and symptoms of TB in that age group. According to the Stop TB Partnership, 200 children die from TB every day. Yet it costs less than three cents a day to provide therapy that will prevent children from becoming ill with TB and 50 cents a day to provide treatment that will cure the disease. Mr. Ban pointed out that some 46 million people have been cured and 7 million lives have been saved since 1995 thanks to the efforts of the UN, governments, donors, civil society groups, private partners, public health experts, and tens of thousands of health workers and affected families and communities. “Now is the time to be even more ambitious and 'Stop TB in our lifetime',” stressed Mr. Ban, referring to the theme of this year's Day.